Technorati legend Dave Sifry last night mentioned that the majority of Twitter feeds are private, locked down by their authors and not searchable through Summize and the usual methods. Same with Facebook posts, of course. Hmmm... maybe "search rights" can be part of a business model for these silo-ed social media companies. Even Fox News says so. How about that? Which historical figure said, "It's not who gets the votes, it's who counts the votes?" I think it was Stalin. Then again, folks have been worrying about this for years. CNET News.com is pulling the plug on its Newsburst news reader at the end of the month. As blogger (and former CNET sales exec) Chas Edwards points out in his blog, Newsburst was conceived in part to convert "search-click-and-leave" readers into opt-in News.com subscribers. There were others, but Google Reader probably did Newsburst in. We're writing to let you know that as of December, 31 2007, we will be shutting down Newsburst, CNET's Web-based feed reader. you can import your feeds into another Web-based or desktop RSS feed reader. Just log in to Newsburst and look for the 'Download OPML' link at the top of the page. Thanks for being a Newsburst user! CNET does need to get around to conveying this news on Newsburst.com itself. It still looks like business as usual. CNET Networks is a paid subscriber to our members-only site, SWMS. We've got a busy day today but wanted to show you this MediaPost piece about the censoring of text messages we do in this country. If you have a product that competes with the telcos, don't expect to use their networks to market it. Ask Rebtel. We're not talking China, Myanmar, or North Korea. This is here. If you've ever deposited checks at an ATM, you know that you put them in an envelope and slide the envelope into the slot. Not anymore, at least at a Bank of America ATM in Emeryville, CA. There's an OCR in there somewhere. Yesterday I slid two checks directly into the deposit slot. No envelope. The OCR "looked" at the check and asked me whether it had the amount right. It did. I slid a second check in the slot, this one handwritten. The OCR didn't do as well this time. I had to enter the amount into the keypad. My receipt contained a scanned image of the two checks I just deposited. Very cool! Better record-keeping for me, no more buying envelopes for the bank -- not to mention more efficient check processing. * Durable. Nice and solid. * My iWork applications -- Pages, Numbers and Keynote -- read Word, Excel, and Powerpoint files flawlessly. * Spaces, Leopard's multitasking feature, allows you to organize your work among multiple screens. Very cool. * When someone includes their contact info in the signature of the e-mail they've sent you, you can copy all of that contact info into your Mac's Address Book in a single click. It's a huge timesaver. * Google Apps don't run reliably and are not officially supported. * Mac users can't be presenters in GoToWebinar, only attendees. * My Mac somehow can't see certain features of web sites. For example, I can't operate dynamic HTML windows at Foxsports.com. Also, certain Typepad commands I used to use with my old laptop have vanished using the Mac. * GarageBand doesn't store audio files as MP3s, which complicates producing a podcast. I exported my last podcast to iTunes, where I think I converted it to MP3, but in any case I couldn't figure out how to get it posted to the web. I'm sticking with it. I bought a year's worth of training and already took a lesson. But migrating has not been easy. An industry friend of mine has urged me to get smart about in-text advertising, which he says is growing like crazy. In-text advertising enables commercial messages to pop up on a user's screen when a mouse rolls over highlighted words in editorial content. The pop-up can contain text, images, Flash animation or video and displays right there on the screen without the user needing to do anything else. 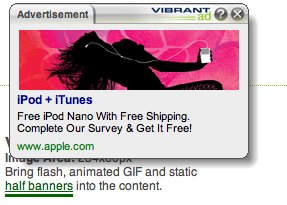 Please take the time to click this link and witness the future of web advertising. You'll be amazed. Also, be thinking about how this technology can affect what editors choose to cover. Vibrant Media is the chief perpetrator, er, provider of this technology. They're bigger in Europe than they are here -- at least for now. Saw the 3-D version today. I came away with a strong sense of why the movie-going experience is not going away anytime soon. It surely was expensive to produce such an epic. But 3-D inevitably will be adapted to more prosaic productions. And today's home theatre experience will be in for an upgrade.